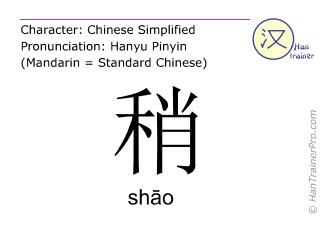 You cannot listen to the pronunciation of shao because your browser does not support the audio element. 注: 这个汉字包含有发音 shào。 但是，在不同的发音情况下，这些汉字的意思也会发生改变 (not yet available in this dictionary). 这是因为这个汉字的含义并不能在英文中作为翻译显示，从而归类到变灰显示的类别。 例如, 必 (bì)有必须要、不得不的含义，但是 must的中文翻译并不是必 (bì)而是必须 (bìxū)., gradually"为什么有些翻译是变灰显示的?" 汉字 汉字(现代汉字即简体字)，点击下方的小字看汉字的笔划顺序动画来学习怎样正确的书写汉字"我们怎样正确书写 稍 ( shāo ) ?" 稍 is composed of 12 strokes and therefore is of average complexity compared to the other simplified Chinese characters (average: 13.1 strokes).